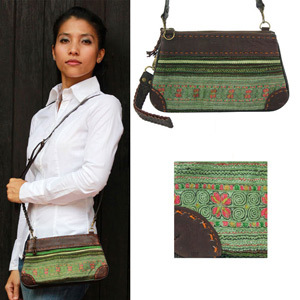 Handcrafted of quality cotton and leather, this elegant shoulder bag by Chirada Loetparisanyu features a green pattern embroidered by hand by hill-tribe artisans. Lined with velvet, the bag features two zipped compartments. One compartment hides a zipped pocket in its interior, the other compartment two small pockets, on of them to hold a small cell phone. Brass studs on the shoulder strap permit the length to be adjusted. 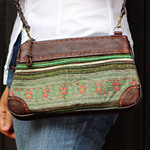 The leather strap and braided handle are removable. This piece makes for a versatile and stylish accessory. Materials: Velvet (cotton) 45%, cotton 35% and leather 20%.